Medium - $121.99 Only 1 left! Large - $121.99 Only 2 left! X-Large - $121.99 Only 2 left! 2X-Large - $121.99 Only 1 left! Are you behind-the-scenes magic maker of your household? Do you love baking cookies and other goodies? Have penchant for serving hot cocoa to your hubby after a long night of work? Then you have a lot in common with the first lady of the North, Mrs. Claus! Mrs. Claus is the unsung hero of the North Pole – always making sure that Santa Claus has everything he needs in order to get the toys delivered to the children of the world each year. Though we don’t talk about her much, she keeps the machine that is Santa’s Workshop rolling smoothly at all times, and we should celebrate her just as much as we celebrate Santa each Christmas! 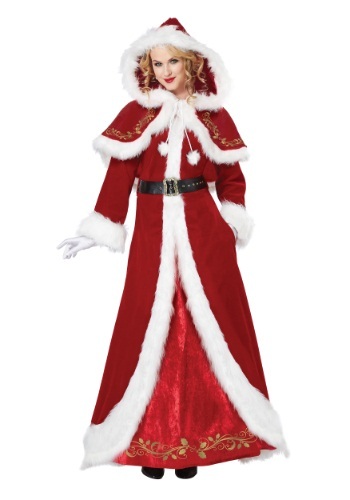 If you are getting ready for a holiday gathering and want to impress your guests, this Mrs. Claus costume is the perfect way to upstage even the big man himself! Whether it’s to complement our Santa Claus costume or to fly solo, you'll love the rich details on this Deluxe Classic Mrs. Claus Costume! It's edged with luxurious faux fur, with gold embroidery. It's perfect for serving Santa his cocoa and cookies before his big Christmas delivery trip. The 100% polyester crushed velvet and faux fur give this dress a classic holiday look and the fur edging at the collar, cuffs, and hemline give it a warm look that Mrs. Claus surely needs in the North Pole! The velvet capelet and matching hat add the final touches to this traditional Mrs. Claus costume – perfect for plays, holiday parties, and family gatherings.